Hello, everyone. I hope you have had a lovely summer. We ended up scaling back a bit on our regular schedule, doing about half as much formal “schoolwork” as usual and twice as much riding bikes and going to the playground. This is my favorite book we read this summer. This is a new edition of a book originally published in 1965, but its age isn’t really important because geometry hasn’t changed much in the intervening years. The story begins with geometry in nature–the shapes of trees and flowers, spiderwebs and honeycombs–then develops a speculative account of how early stoneage humans might have become increasingly aware of and attuned to these shapes. Men saw the shapes of the sun and moon in the sky, and might have observed that an ox tied to a pole traced out a similar shape in the dirt. Then Egyptian surveyors developed right triangles, used for measuring the corner of fields and pyramids. The Mesopotamians developed astronomy, and divided the circle into 360 degrees. Then came the Greeks–clever Thales, mystical Pythagoras, and practical Archimedes. And finally, at the end, Eratosthenes (who used geometry–literally, earth measuring–to measure the circumference of the Earth,) and a few paragraphs about Euclid. I am sure these books are not everyone’s cup of tea. They may not be yours. But they were what we needed. My eldest children are fairly different in writing needs, but I do not have time for separate curricula. One is a good speller, the other bad. One has acceptable handwriting, the other awful. One will write independently, the other hates writing and plays dead if I try to get them to write. These books have worked well for everyone. Spelling, handwriting, and general willingness to write have all improved. Even if you aren’t homeschooling, this book might make a good supplement to your kids’ regular curriculum. Just be careful when handling large quantities of bacteria. Even if it’s normal household bacteria that you’re exposed to regularly, you’re not used to it in these quantities. The instructions recommend wearing gloves and safety goggles while handling bacteria and making slides out of them–and besides, kids like dressing up “like scientists” anyway. Our pattern blocks have been in the family for decades–passed down to me by my grandmother–but the geoboards are a new acquisition. I remember geoboards in elementary school–they sat behind the teacher’s desk and we never actually used them. I didn’t know what, exactly, geoboards were for, so I went ahead and got new workbooks for both them and the pattern blocks. We are only a few lessons in, but so far I am very pleased with these. We have been talking about angles and measuring the degrees in different shapes with the pattern blocks–360 in a circle, 180 in a triangle, 720 in a hexagon, etc–which dovetails nicely with the geometry reading. The geoboards let us construct and examine a variety of different shapes, like right and equilateral triangles. The lesson plans are easy to use and the kids really enjoy them. Just watch out for rubber bands flying across the room. Super Source makes workbooks for different grade levels, from K through 6th. This book introduces Python, and is a nice step up from the Scratch workbooks. You may have to install a couple of programs, like Python and the API spigot, but the book walks you through this and it is not bad at all. There are then step-by-step instructions for making simple programs, along with bonus challenges to work out on your (or your kid’s) own. The book covers strings, booleans, if statements, loops, etc, in kid-friendly ways. Best for people who already love Minecraft and can type. I wish this chapter had been much longer; we speed through almost 2.5 million years of cognitive evolution in a couple of pages. The earliest hominins had about the same short-term memory as a modern-day chimpanzee, which is to say they could keep track of only two operations at a time. … Our methods for creating tools gradually became more sophisticated, until we were using the tools we created to produce other tools in a repetitive and predictable manner. These processes for creating stone tools were among humanity’s first production algorithms-that is, the earliest code. They appeared almost simultaneously in human communities in most part of the world around 40,000 BC. …[E.O.] Wilson refers to this phenomenon more broadly as the discovery of eusocial behavior… Wilson situates the date far earlier in human history than I do here. I chose 50,000 years [ago] because my focus is on the economy. it is clear that an epochal change in society occurred roughly 10,000 years BCE, when humans invented agriculture in six parts of the world simultaneously. The fact of this simultaneity directly suggests the advance of code represented by the invention of agriculture was part of a forward movement of code that started much earlier. What do you think? Does the simultaneous advent of behavioral modernity–or eusociality–in far-flung human groups roughly 50,000 years ago, followed by the simultaneous advent of agriculture in several far-flung groups about 10,000 years ago speak to the existence of some universal, underlying process? Why did so many different groups of people develop similar patterns of life and technology around the same time, despite some of them being highly isolated? Was society simply inevitable? Just hitting the end of a pebble once to create one edge, as in the simplest tools, they calculate requires holding three items in the working memory. Removing several flakes to create a longer edge (a line), takes STWM 4; working an entire side takes STWM 5; and working both sides of the stone in preparation for knapping flakes from the third requires both an ability to think about the pebble’s shape in three dimensions and STWM 7. It took about 2 million years to proceed from the simplest tools (working memory: 3) to the most complex (working memory: 7.) Since the Neolithic, our working memory hasn’t improved–most of us are still limited to a mere 7 items in our working memory, just enough to remember a phone number if you already know the area code. All of our advances since the Neolithic, Auerswald argues, haven’t been due to an increase in STWM, but our ability to build complexity externally: through code. And it was this invention of code that really made society take off. By about 10,000 BCE, humans had formed the first villages… Villages were the precursors of modern-day business firms in that they were durable association built around routines. … the advance of code at the village level through the creation of new technological combinations set into motion the evolution from simplicity to complexity that has resulted in the modern economy. It was in the village, then, that code began to evolve. What do you think? Are Read and van der Leeuw just retroactively fitting numbers 3-7 to the tools, or do they really show an advance in working memory? Is the village really the source of most code evolution? And who do you think is more correct, Herbert Spencer or Thomas Malthus? The advent of the “jobbe” a a lump of work was to the evolution of modern society something like what the first single-celled organism was to the evolution of life. The “jobbe” contrasted with the obligation to perform labor continuously and without clearly defined roles–slavery, serfdom, indentured servitude, or even apprenticeship–as had been the norm throughout human history. Did the Black Death help create the modern “job market” by inspiring Parliament to pass the Statute of Laborers? The idea of making a bargain when two persons entered upon some particular piece of work, the one as employer, the other as employed, was entirely repugnant to the older generation, since it was assumed that their relations as inferior and superior should determine their financial relations; the superior would do what was right, and the inferior should accept what the superior might give without a question or a murmur. Among the samurai, where the arrangement is between equals, bargaining or making fixed and fast terms which will hold to the end, and which may be carried to the courts in case of differences, was a thing practically unknown in the older civilization. Everything of a business nature was left to honor, and was carried on in mutual confidence. “Since the overthrow of communal feudalism and the establishment of an individualistic social order, necessitating personal ownership of property, and the universal use of money, trustful confidence is rapidly passing away. We still identify ourselves with our profession–“I am a doctor” or “I am a paleontologist”–but much less so than in the days when “Smith” wasn’t a name. In the past two hundred years, the complexity of human economic organization has increased by orders of magnitude. Death rates began to fall rapidly in the middle of the nineteenth century, due to a combination of increased agricultural output, improved hygiene, and the beginning of better medical practices–all different dimensions of the advance of code…. Greater numbers of people living in greater density than ever before accelerated the advance of code. By the twentieth century, the continued advance of code necessitated the creation of government bureaucracies and large corporations that employed vast numbers of people. These organizations executed code of sufficient complexity that it was beyond the capacity of any single individual to master. I’ve often wondered if the explosion of communist disasters at the beginning of the 20th century occurred because we could imagine a kind of nation-wide code for production and consumption and we had the power to implement it, but we didn’t actually have the capabilities and tools necessary to make it work. We can imagine Utopia, but we cannot reach it. Before the “job”, before even the “trade,” people lived and worked far more at their own discretion. Hoeing fields or gathering yams might be long and tedious work, but at least you didn’t have to pee in a bottle because Amazon didn’t give you time for bathroom breaks. Every time voters demand that politicians “bring back the jobs” or politicians promise to create them, we are implicitly stating that the vast majority of people are no longer capable of making their own jobs. (At least, not jobs that afford a modern lifestyle.) The Appalachians lived in utter poverty (the vast majority of people before 1900 lived in what we would now call utter poverty), but they did not depend on anyone else to create “jobs” for them; they cleared their own land, planted their own corn, hunted their own hogs, and provided for their own needs. Today’s humans are (probably not less intelligent nor innately capable than the average Appalachian of 1900, but the economy (and our standards of living) are much more complex. The average person no longer has the capacity to drive job growth in such a complicated system, but the solution isn’t necessarily for everyone to become smarter. After all, large, complicated organizations need hundreds of employees who are not out founding their own companies. But this, in turn, means all of those employees–and even the companies themselves–are dependent on forces far outside their control, like Chinese monetary policy or the American electoral cycle. And this, in turn, raises demand for some kind of centralized, planned system to protect the workers from economic hardship and ensure that everyone enjoys a minimum standard of living. Microstates suggest themselves as a way to speed the evolution of economic code by increasing the total number of organisms in the ecosystem. With eusociality, man already became a political (that is, polis) animal around 10,000 or 40,000 or perhaps 100,000 years ago, largely unable to subsist on his own, absent the tribe. We do not seem to regret this ill-remembered transition very much, but what about the current one? Is the job-man somehow less human, less complete than the tradesman? Do we feel that something essential to the human spirit has been lost in defining and routinizing our daily tasks down to the minute, forcing men to bend to the timetables of factories and international corporations? Or have we, through the benefits of civilization (mostly health improvements) gained something far richer? Anyway, today we are continuing with our discussion of Jane Goodall’s In the Shadow of Man, featuring the adventures of chimpanzees from The Gombe Stream National Park, Tanzania. The book contains many interesting vignettes of chimpanzee life and descriptions of their social order. I wish I could share more of them, but my fingers are tired of typing, so here we go. (As usual, for readability I’m just using “” for the quotes instead of block quotes, and they’re organized around several themes.) I’ve tried to bold the names of the chimps the first time they appear. 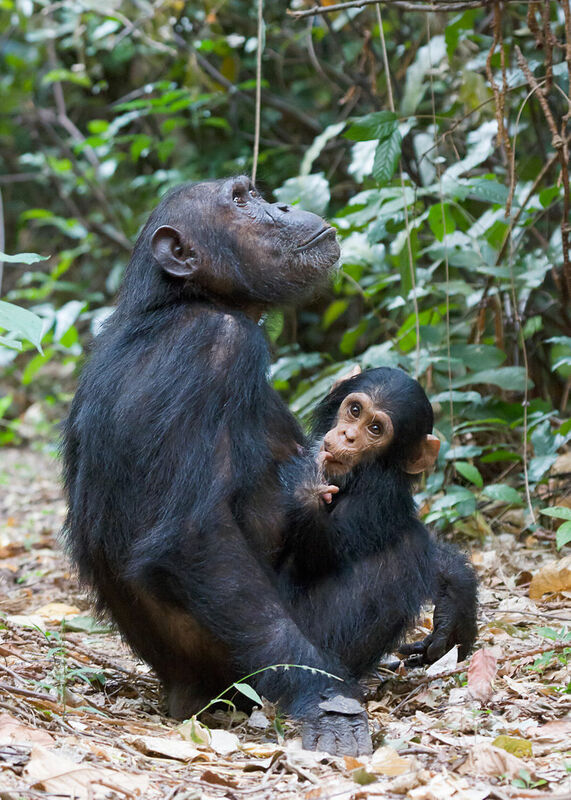 “One day I arrived on the Peak and found a small group of chimps just below me in the upper branches of a thick tree. As I watched I saw that one of them was holding a pink-looking object from which he was from time to time pulling pieces with his teeth. There was a female and a youngster and they were both reaching out toward the male, their hands actually touching his mouth. Presently the female picked up a piece of the pink thing and put it to her mouth: it was at this moment that I realized the chimps were eating meat. “After each bite of meat the male picked off some leaves with his lips and chewed them with the flesh. Often, when he had chewed for several minutes on this leafy wad, eh spat out the remains into the waiting hands of the female. Suddenly he dropped a small piece of meat, and like a flash the youngster sung after it to the ground. Even as he reached dot pick it up the undergrowth exploded and an adult bushpig charged toward him. … Soon I made out the shapes of three small striped piglets. Obviously the chimps were eating a baby pig. The size was right and later, when I realized that the male was David Graybeard, I moved closer and saw that he was indeed eating piglet. EvX: it is much easier to dismember carcases when you have tools at your disposal, like stone knives. “On other occasions, the hunting seems to be a much more deliberate, purposeful activity, and often at such times the different individuals of a chimpanzee group show quite remarkable cooperation–as when different chimpanzees station themselves at the bases of trees offering escape routes to a cornered victim. “At this time, the third year of Mike‘s supremacy, Rodolf was no longer the high-ranking male he had once been. How was it, then, that he dared push away Mike’s hand, he who normally went into a frenzy of submission when Mike approached him? … I had seen this sort of apparent inconsistency before during meat-eating episodes and I often wondered whether the chimps were showing the crude beginnings of a sot of moral values. Rodolf killed the baboon, therefore, the meat was Rodolf’s. More serious consideration of the behavior has led me to that something rather different maybe involved. “At about noon the first heavy drops of rain began to fall. … At that moment the storm broke. The rain was torrential, and the sudden clap of thunder, right overhead, made me jump. As if this were a signal, one of the big males stood upright and as he swayed and swaggered rhythmically from foot to foot I could hear the rising crescendo of his pant-hoots above the beating of the rain. Then he charged, flat-out down the slope toward the trees he had just left. He ran some thirty yards, and then, swinging round the trunk of a small tree to break his headlong rush, leaped into the low branches and sat motionless. EvX: the chimps do not build nor take any kind of shelter from the rain, but just sit hunched up in it, looking pretty miserable for much of the rainy season. “Suddenly I saw a large male chimpanzee climbing a tree only a couple of yards away. He moved over into the branches over my head and began screaming at me, short, loud, high-pitched sounds, with his mouth open. … He began climbing down toward me until he was no more than ten feet above me and I could see his yellow teeth… He shook a branch, showering me with twigs. Then he hit the trunk and shook more branches, and continued to scream and scream and work himself into a frenzy of rage. All at once he climbed down and went out of sight behind me. “It was then that I saw a female with a tiny baby and an older child sitting in another tree and staring at me with wide eyes. They were quite silent and quite still. I could hear the old male moving about behind me and then his footsteps stopped. He was so close by that I could hear his breathing. “Without warning there was a loud bark, a stamping in the leaves, and my head was hit, hard. At this I had to move, had to sit up. The male was standing looking at me, and for a moment I believed he would charge; but he turned and moved off, stopping often to turn and stare at me. The female with her baby and the youngster climbed down silently and moved after him. 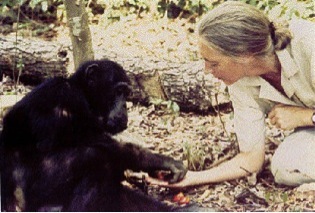 There was a sense of triumph: I had made contact with a wild chimpanzee–or perhaps it should be the other way around. “One day as I sat on the veranda of the tent, David climbed down from his tree and then, in his deliberate way, walked straight toward me. When he was about five feet from me he stopped, and slowly his hair began to stand on end, until he looked enormous and very fierce. A chimpanzee may erect his hair when he is angry, frustrated, or nervous. Why had David now put his hair out? All at once he ran straight at me, snatched up a banana from my table, and hurried off to eat it farther away. Gradually his hair returned to its normal sleeked position. Warning: this post contains spoilers. Lots of spoilers. I needed a break from politics, so I decided to read a book about a kid and his dragon. What better than the junior novelization of a Disney Movie? Pete’s Dragon is a remake of the 1970s Disney live-action/animation mix of the same name. I saw the preview before finding Dory, thought it looked awesome, and so picked up the book-version. I assume that the book follows the movie’s plot accurately, though I do not expect it to capture the full cinematic experience. Within the first chapter, that “awesome” feeling had diminished and I had the sinking feeling that the story was going to end with a generic, “kid goes to live among humans again” ending. And it did. 5 year old Pete is on adventure with his parents in the woods when his dad crashes the car into a tree. His parents die. Pete emerges from the wreck, gets chased by wolves, and is saved by a big, shaggy dragon. 6 years later, Pete and the dragon (named Elliot) are best friends and run around the woods having fun, in a scene that I assume is spectacular in the movie. The story then switches to the perspective of a bunch of grownups, each with their own plot and character arc. Mr. Meacham (IIRC) is an old guy who tells dragon stories to the local kids. His (grown) daughter, a forest ranger, doesn’t believe him. The forest ranger’s boyfriend has a brother who is a bumbling, vaguely evil logger who is illegally logging trees in the forest. The forest ranger, instead of arresting him for illegal logging, (which is what I assume happens when a forest ranger catches you illegally chopping down trees,) complains to her boyfriend that he’s not stopping his brother. He fails to stop his brother because he’s also useless. To this cast of 6 (Pete, Elliot, Meacham, Forest Ranger, Boyfriend, and Brother,) we now add another eleven-year-old kid, Natalie. The Boyfriend is Natalie’s dad and he has for some reason brought her to the logging site in the woods, where she wanders around unsupervised while people chop down trees because that isn’t dangerous or anything. Natalie notices Pete and the grown-ups catch him. Pete wakes up in the hospital, freaks out, and escapes in what I assume is another fun sequence in the movie. The grown-ups recapture him and the forest ranger and her boyfriend take him home, where they tame him with PBJ sandwiches and cookies. Pete draws pictures of Elliot and promises to take his new friends to meet Elliot in the morning. Meanwhile, Elliot has been looking everywhere for Pete. He follows Pete’s scent to the house where he’s staying, looks in the window, and decides that Pete has found a new family and doesn’t need him anymore. Elliot goes home. Meanwhile, Forest Ranger lady is conflicted because she promised Pete she’d take him back to the woods to Elliot, who might be a dragon and might prove that her dad was right all along, but legally she’s required to take him to Child Protective Services. Finally she decides to take him to Elliot. The Bumbling Brother abducts the unconscious dragon, the grownups are useless, and Pete and Natalie (and Mr. Meacham) save the dragon. There’s a dramatic chase scene, at the end of which the Brother redeems himself by saving the Boyfriend and Forest Ranger’s lives. Pete and the dragon escape back to the woods, where Pete suddenly decides that he doesn’t want to live with a dragon anymore and returns to the Forest Ranger’s house. You know, the lady who would have turned him over to CPS so he could go live in foster care without blinking an eye if he hadn’t claimed to have been living with a dragon. In the final chapter, Pete and his new family (Forest Ranger, Boyfriend, and Natalie) drive to the mountains, where they visit the dragon, who (after Pete abandoned him) wandered off and randomly found his family of dragons. So what’s wrong with this story? For starters, it suffers from Too Many Characters. This is a kid’s book (movie.) Kids are interested in the antics of other kids; kids aren’t interested in adults trying to manage their adult relationships. With so many adult characters working through their own issues and character arcs, there is very little room in the story (it’s a short book) for Pete to have an arc of his own. In fact, Pete does not have a character arc. He does not debate whether or not he should join the humans, just spontaneously decides it for no particular reason at the end of the story. Look, dragons are awesome. Living with a dragon is awesome. Most kids also think their own parents are pretty awesome. Random grownups you don’t know are not awesome. A life of wearing clothes, going to school, and doing homework is way less awesome than living in the woods with your dragon. Pete abandoning his dragon makes as much sense as a child spontaneously abandoning a beloved pet. In short, the ending is completely unmotivated and makes no sense. It still might be a fun movie (the special effects looked nice in the preview,) so long as the “gun-toting, ginger ale-swigging, bumbling logger” as bad guy doesn’t annoy you too much. But I was genuinely disappointed by the book. Set in the little-known backwoods region of Florida, [Strawberry Girl] is Birdie Boyer’s story; of how she and her fierce Cracker pride battled nature, animals, and feuding neighbors to become the best “strawberry girl” the backwoods ever knew. I confess: I picked this one out of the used books bin for the obvious reason. The newly-released, 60th anniversary edition has a different back blurb, which doesn’t mention “Crackers.” I don’t know if they censored the text, too. 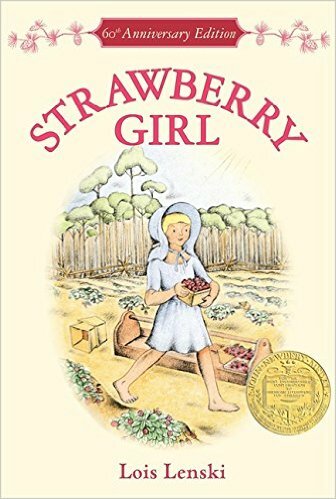 Strawberry Girl is a middle grade novel–about right for a fourth or fifth grader, depending on their tolerance for dialect–along the lines of the Little House Series. Few people realize how new Florida is, or that, aside from the early Indian and Spanish settlements, Florida has grown up in the course of a single man’s lifetime. In the early 1900’s, the date of my story, Florida was still frontier country, with vast stretches of unexplored wilderness, woodland and swamp, and her towns were frontier towns thirty and forty years later than the same frontier period in the Middle West. My material has been gathered personally from the Crackers themselves, and from other Floridians who know and understand them. I have visited in Cracker homes. … All the characters in my book are imaginary, but practically all incidents used were told to me by people who had experienced them. Florida cracker refers to colonial-era English and American pioneer settlers and their descendants in what is now the U.S. state of Florida. The first of these arrived in 1763 after Spain traded Florida to Great Britain following the latter’s victory over France in the Seven Years’ War. By the 1760s the English, both at home and in the American colonies, applied the term “Cracker” to Scotch-Irish and English settlers of the remote southern back country, as noted in a passage from a letter to the Earl of Dartmouth: “I should explain to your Lordship what is meant by Crackers; a name they have got from being great boasters; they are a lawless set of rascalls on the frontiers of Virginia, Maryland, the Carolinas, and Georgia, who often change their places of abode.” The word was later associated with the cowboys of Georgia and Florida, many of them descendants of those early frontiersmen. There is some debate, it appears, over the word’s origin, whether from Shakespearean usage, “to crack a joke, to boast,” ie, people who were loud-mouth boasters, or from the sound of a whip cracking as the cowboys drove their cattle to market. “Purity of type” is a phrase one doesn’t hear much anymore. You may have noticed Birdie’s bare feet on the cover; Lenski mentions bare feet often in the narrative, and the manure spread on the fields for fertilizer. This, as you know, is a recipe for hookworm infection–which 40% of Southern children suffered from. Hookworm infections cause anemia, malnutrition, malnourishment, lethargy, and death. In fact, the Southern stereotype of lazy, pale, gaunt, and impoverished people–personified in the book by the Slaters–is due, in large part, to the effects of mass hookworm infection. The book takes place around 1900 and the few years after. The first public hookworm eradication campaigns started in 1910, and there was another big campaign going on in Florida at the time the book was published. So I suspect hookworms were on the informants’ and author’s minds when describing their old lifestyles, in a “we didn’t know!” kind of way. The book also depicts two older boys (teenagers) getting in a fight with the school master and beating the tar out of him. Interestingly, in the first chapter of Farmer Boy (in the Little House series,) Almanzo Wilder is worried about the older boys at his school beating the tar out of his teacher. (Farmer Boy is set in Upstate New York.) Was beating up the teacher some kind of regular thing? As is typical for the time, there’s a Prohibition theme (technically, Prohibition never fully ended in parts of Appalachia,) with the grown ups clucking moralistically over the antagonist’s habit of spending all of his family’s money on alcohol and then going into alcohol-fueled rages. Unfortunately, the ending is not very good–it basically feels like the author decided she was done writing and so the main antagonist spontaneously found Christ and decided to stop being lazy and mean, but this is an overlookable flaw in an otherwise good book.